I dipped the chunked up fillets into a flour and spice mix. Then into a batter of eggs and milk. Then rolled them in bread crumbs. (I made these by drying some day old bread we get free from our baker friend on our wood burner.) Then fried them in our cast iron skillet in butter and corn oil. They were so good sometimes I had them with rice twice a day. Yes, they have some small "Y" bones but you learn how to avoid them. Once upon a time a friend gave me some pine salve to try. She said her daughter used it to help clear up the skin problem she had. Well ever since I set my eyes and nose on it I have wanted to make some. I came across some places that had information on it and took what was worth keeping. So now I will attempt to concoct my own version of it. First you start with a glob of pitch from a pine tree. As I looked expectantly to the tree in our yard I envisioned myself scaling the sappy thing in search for that pungent treasure. In the meantime I had to get the doggy do up and out of the ways of unsuspecting shoes. As I attacked it with my shovel, I noticed it was a bit different looking. What had my dog been eating? I pocked it. It had a bit of a spring. I, well, smelled it and to my surprise it was a big chunk of pine pus. My mom got one of those topsy turvy tomato planters you see all over the place that grows the plant upside down. We got to thinking that maybe someone had figured how to “home-make” one. A friend googled it and came up with a plan. We took a 5 gallon pail (acquired through a friend that owns a bakery) and cut a 2 1/2 inch hole in the bottom for the plant to go through. In the ready made one there is a piece of foam to go around the stem of the plant. I had packing foam that we must have gotten a computer something in and used that. That’s the red thing in the picture. In the other bucket (picture down to the right here) we are experimenting with the black ground cloth instead of the foam. So, we put the foam around the base of the stem, gently pushed the plant through the hole, filled the bucket up with some light compost and hung it up. Then we watered it. Examples examples I love examples. So here is Ben being a fine example of a prosumer. Heading off to work with his gas saving "truck." Not only is he going to save money on gas, he is going to be warming up for the job down the road (literally). To start with, the kiddie trailer was purchased at a garage sale. So was the bike as a matter of fact. We have used this trailer for grocery shopping and any number of hauling adventures. Oh and the occasional child has taken a ride in it. We suggest Ben tries hauling his surfboard someday. And yes there is good surfing on Lake Michigan. Real Men surf the lakes. So here is the finished Eye Cream. Next time I'll add a bit more lavender essential oil and this being spring heading into summer I will add extra beeswax. They do that with chocolate you know. More or less wax according to the season. John headed out to his first edible plant walk of the season at Kohler-Andrea State Park. I loaded him up with the thermoses of hot water, cups and his favorite teapot. He makes nettle tea for the people to sample. It is a very easy tea to like. We try to have it every morning while we can. Let's continue the eye cream conversation. The recipe called for fresh horsetail. I am sure you will recognize it now. I harvested it in a more swampy area. Drying overnight gets rid of some of the water content before I infuse it. Same with the violet leaves and flowers also pictured. So tomorrow I will add this all to olive oil and infuse for about five hours in a little crock-pot. More to follow on the progression of the eye cream. It's rhubarb time again. And once again it is time to wow the friends and family with my getting to be famous nectar. Simple as pie. Wait a minute,I never thought pie was simple. Anyway, get yourself 12 cups of chopped up rhubarb and put it in a pot with 2 1/2 quarts of water. Heat it up and cook the rhubarb 'till soft. Strain it through a fine mesh strainer (as pictured) . To the strained juice add a cup of honey and 2 cups of unsweetened orange juice. Chill and serve. Oh and don't forget to secure the vault you will have to store it in as it is much desired by most and to fight for. I was doing the wash today and thought I would write a bit on our prosumer laundering. Clothes that is. I realize that there are people that don't own a dryer and possibly never have. In our married years we only had access to one for a couple of those years. We have a friend from the Czech Republic that says she doesn't know anyone who has one there. What a sad situation eh? (eh is Canadian for huh). But I never thought that I just couldn't live without one. I have included a picture of my solar drier so you can get familiar with the construction of it. Two poles and laundry hanging rope to string between them. To the right here is what I call "clippy things". This is one of the wonderful pieces of equipment we brought back from Japan with us. So weather conditions pose no problems for me on laundry day. Ah Spring. Time for that sweet little beauty that claims a good part of our property. Not only is it gorgeous, it is tasty and medicinal and a great ingredient for an eye cream I make. First the edibleness of it.It goes well in salads. By "it" I mean the leaves and the flowers. The leaves are mild, sweet and slightly peppery (as stated in Identifying and Harvesting Edible and Medicinal Plants by Steve Brill). The flowers and leaves are blood purifiers and detoxifiers. They contain rutin and vitamin C.
The neat thing about their properties is that they are really beneficial in the eye cream I make.They strengthen the capillaries on that delicate skin. So whether you eat the violet or put it on your skin....it goes in. How wonderfully poetic. Remember the empty 4x4 box? Well here it is with some tasty morsels John is munching on. This is Wisconsin, this is cold 'till July and about mid July the snow flies. Not really, but you will notice the glass panels leaning up against the box. Those go on at night and part of the day to warm the soil up. The squares to the right of the bunch of greens have four lettuce in each but they are little yet. Also, during the day when we have the glass off we put the wire cages over them to protect from those nasty deer. Pretty creatures, but too assuming and piggish.But hey, I figure if we fatten them up....they should oblige us and fatten us up in turn. To the left in the picture is the garlic I planted in the fall. And what you can't see are the trellises John just constructed for the peas to climb on that are about 4 inches high now. I could have started them even earlier. Hope this gives you an idea on garden timing for some things. Frugal! Is it the New Big Thing? It seems frugal is now hitting the big times and more and more people are jumping on the band wagon. Here are a some recent articles in the big name magazines. Check them out. The cover of the Magazine is "The New Age of Frugality." Also has an interesting video on a family and how frugality made a big difference in their life. Many people want to live off the land or learn to be more self sufficient. In other words they want to be prosumers. As I have mentioned in my other writings very few can survive off the land and those who can don’t want to. They know it is very hard work just to maintain a subsistent level of living. It’s fairly easy to pick out those people who have very little “survival” or self reliant skills. I know. I was one of them. They want to head for the wilderness and “live off the land”. Ha! Most of these people would starve if I dropped a dead deer at their feet. They would have no idea how to butcher or preserve it. 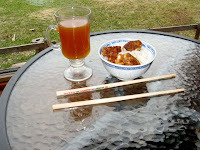 (I learned this skill one very rainy cold night by lamp light with the how to book in my hand and a knife in the other). Vegetarians would have to wait for spring to eat. At any given week there is a happy parade of people through our house,property,kitchen.I get charged up with the sometimes constant flow. People to teach as well as teach us. Lessons in frugality as well as spiritual lessons or just plain life as it is. Normally I love to bask in “peace and quiet”. But I also love the electricness (my computer says that is not a word. tough) of the interaction and all. And it seems that right around eating time is the interacting hour of choice. I take care of that with the number one most used appliance in my kitchen. No, it’s not the dishwasher. He’s not always around. It is the most honorable rice cooker. We bought it brand new in 1993 (what? that’s not frugal you screech).It is if your tools save you time and money. Anyway, It goes non-stop around here and sometimes a couple loadings a day.The rice comes out great.